While some may say there is no such thing as a good knot, some knots are not as bad as other knots. Two kinds of knots may pop up in – or out of – your wood: red knots and black knots. Red knots are formed by branches that were living when the tree was cut down. Black knots are the remains of branches that died – perhaps a hundred or more years before the tree was felled. The black is the bark and pitch that surrounded the once-living branch and was subsequently enveloped by the tree as the trunk grew wider. Knotty pine, the paneling so fashionable in the 1940s and ’50s, owed its design to red knots, which are well-fastened to the wood around them. Black knots, however, tend to loosen and pop out. To most woodworkers, especially furniture-makers, all knots are bad. Because they expand and contract differently from the wood around them, and may have different densities, they can lead to uneven finishes and often weakened structures. 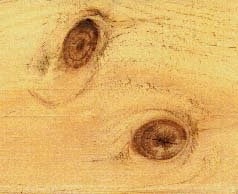 Black knots can simply fall out, resulting in knot holes, which can significantly weaken the wood and, in a table top or door, provide an awkward opening. So especially if it’s black, you would not want a wood knot.